Anyone who knows me, or has read my About page, or has spent about 2 seconds browsing this blog, knows that I am a bit obsessed with creating special desserts for my kids’ birthdays. It started when they were babies and I first began dabbling in cake decorating. Clowns, Dalmatians, football fields, and hula dancers were my focus of birthdays past. Now my “kids” are 26 and 22 and I am still obsessing over celebration baking! For my son’s past two birthdays, I baked goodies shaped like birthday cakes. Birthday Cake Pops were my first attempt at cakes pops. I was delighted with how much the little cake-shaped pops resembled birthday cakes, especially when the real candle on top was lit! Last year, Birthday Cake Surprise Cookies also looked like miniature cakes complete with real candles, but instead of soft cake balls on a stick, these were birthday cake shaped cookies with a surprise stash of mini M&M’s inside! 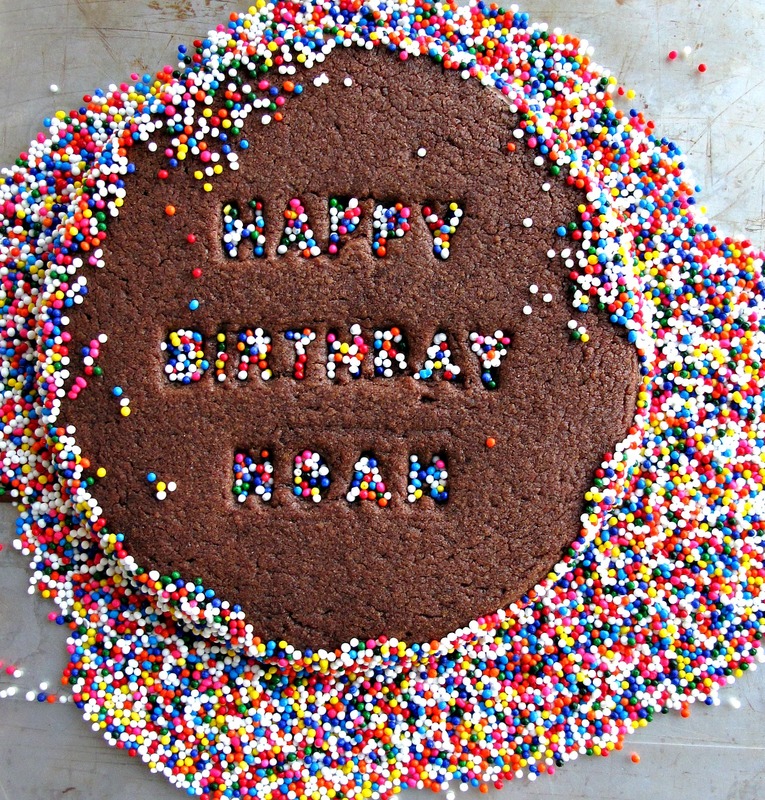 For this year’s birthday treat,Celebration Sprinkle Cookies, the emphasis is on “celebrate”, and I let multitudes of rainbow colored sprinkles do the talking. 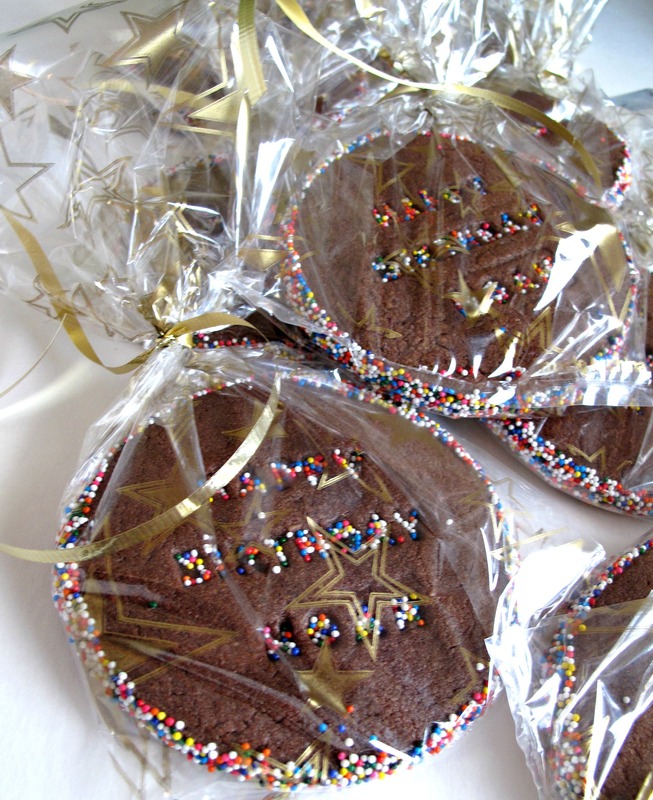 The same delicious roll-out chocolate sugar cookies from Lilaloa that I have used so many times before, gets bathed in chocolate, then embellished with nonpareil sprinkles. 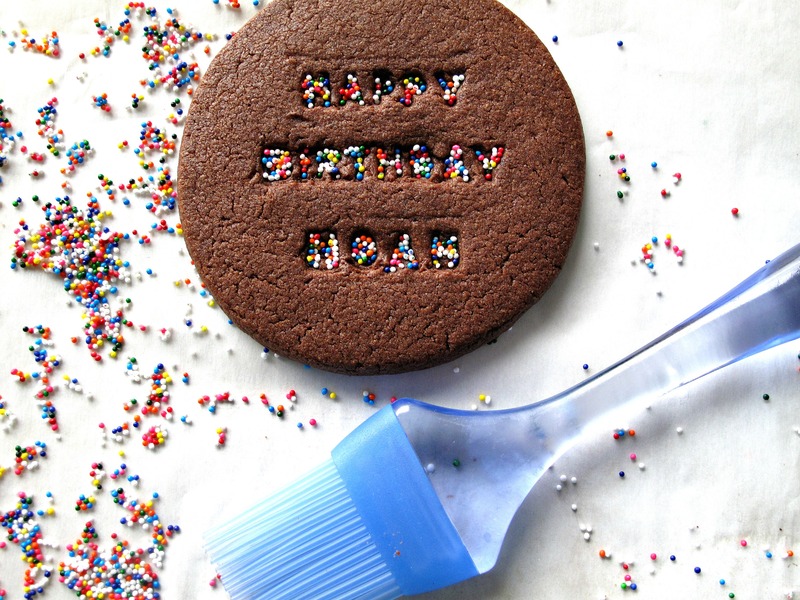 I embossed the birthday message onto the Celebration Sprinkle Cookies using a fun set of cookie cutters I purchased at World Market (I have been told that William Sonoma has a similar set). The set comes with three cookie cutters and an alphabet of little individual plastic letters and prearranged phrases. The cookie cutters are made to imprint up to two lines. Because I wanted three lines, I didn’t use the special cookie cutters for imprinting. Instead, I pressed the letters into the dough myself. The words “happy” and “birthday” were premade. For ease of handling, I made an imprinting stamp with my son’s name using the individual letters double sticky taped onto a piece of cardboard. The message is probably easier to read without sprinkles, but I couldn’t help adding some extra pizzazz. Immediately after removing the cookies from the oven, I sprinkled the nonpareils into the imprinted letters, then gently brushed off the excess with a pastry brush. 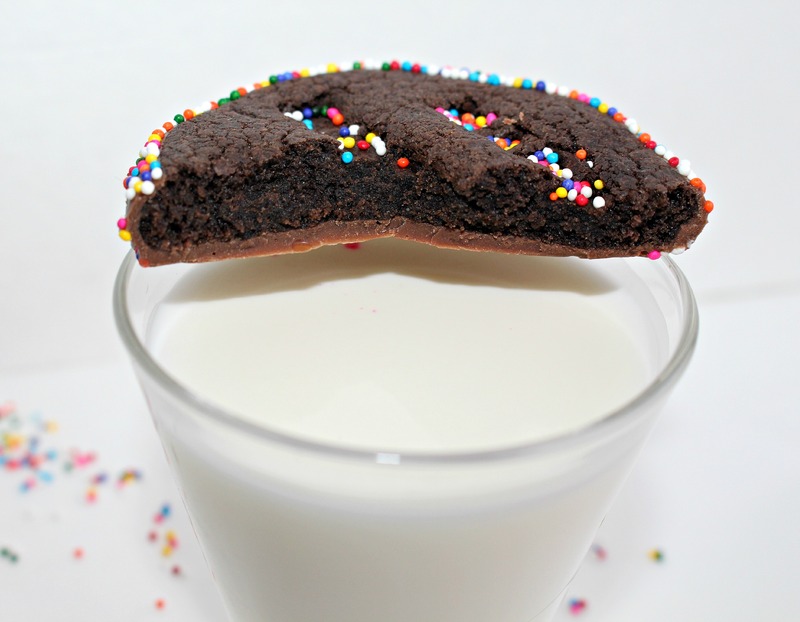 The heat of the cookies melts the sprinkles just slightly, holding them in place. Once the cookies were completely cool, I placed them into a bowl of melted Chocoley.com Candy and Molding milk chocolate discs to coat the bottom and sides of the cookies. Sprinkles were added to the melted chcolate on the sides of the cookies. 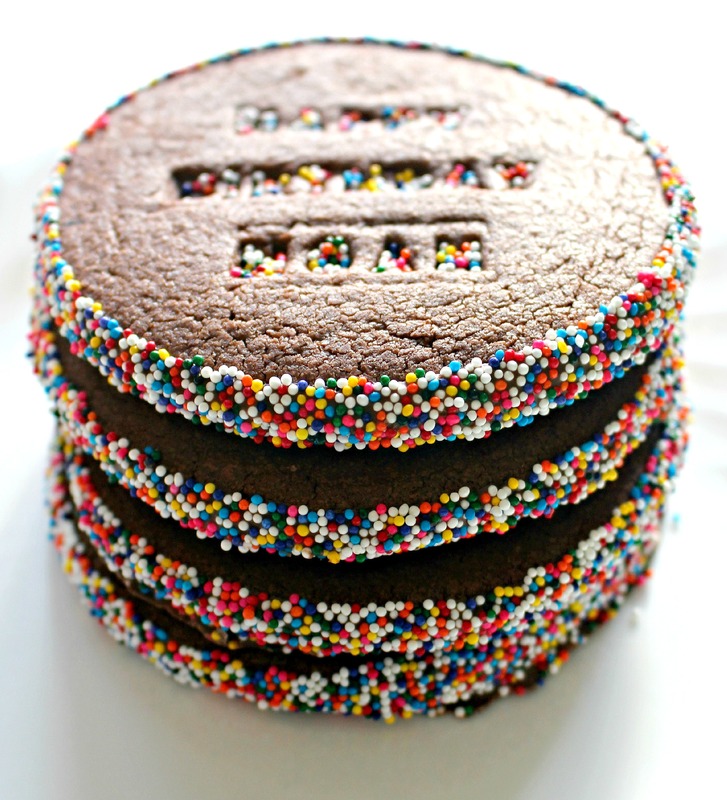 After 10-15 in the refrigerator to set the chocolate, the Celebration Sprinkle Cookies were party ready! 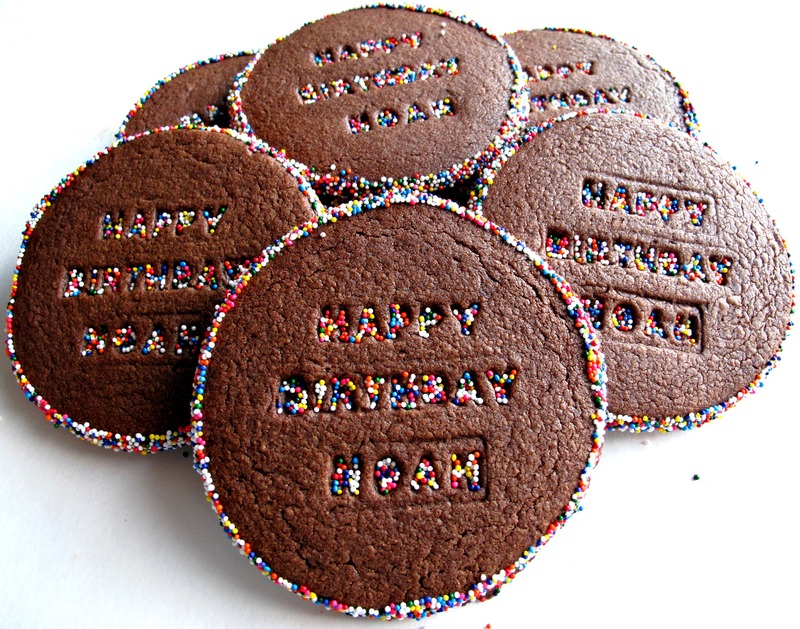 Happy Birthday, Noah! I love you. Pre heat oven to 375˚F. Line a baking sheet with parchment paper. Gradually add flour, 1 cup at a time. 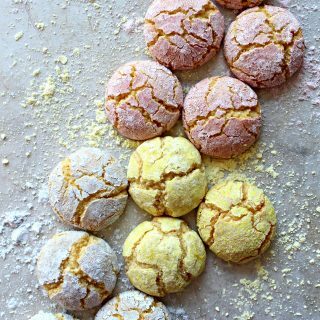 If making the cookies right away, use 3 ½ cups of flour. If refrigerating dough for use in several hours or several days, use only 3 cups of flour. Cut out circles and imprint with cookie stamps. Transfer to prepared baking sheet and bake for 7-8 minutes. 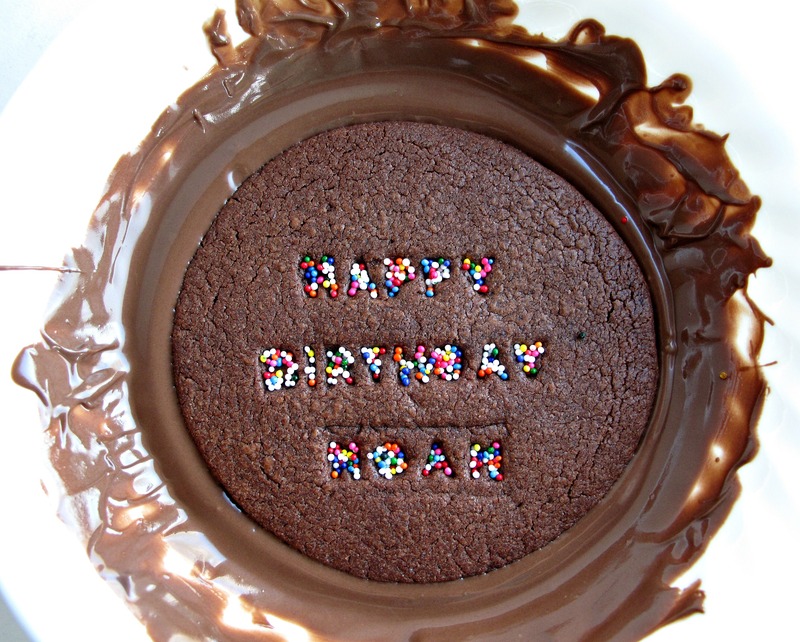 Immediately after removing from oven, fill the imprinted words with sprinkles. Gently brush off excess sprinkle with a pastry brush. Cool on baking sheet for 10 minutes then transfer to a wire rack to cool completely. Line a baking pan with sides (a size that will fit in your refrigerator) with wax paper. The sides are necessary to contain loose sprinkles. 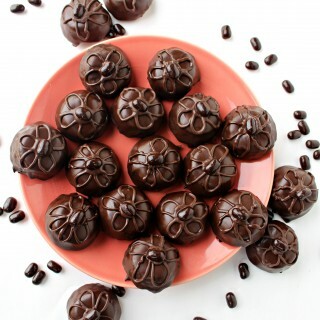 Melt half of the chocolate coating discs in a shallow bowl in the microwave at 50% power for 30 seconds. Stir, then return to the microwave for 10-20 second intervals at 50% power just until completely melted. Depending on the size of your pan, work with groups of 3 or 4 cookies. Place a completely cooled cookie on top of the melted chocolate and gently press down until the bottom and sides of the cookie are immersed in chocolate. 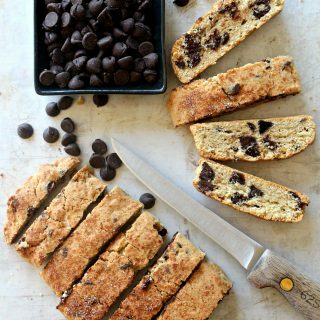 Use two forks under the cookie, one on each side, to gently lift the cookie out of the chocolate and onto the prepared baking pan. Immediately cover the chocolate coated sides of the cookie with sprinkles. After completing 3 or 4 cookies place the pan in the refrigerator for 10-15 minutes to set the chocolate. Repeat with the remaining cookies, melting additional chocolate discs as needed. Store at room temperature in an airtight container for up to 2 weeks. Separate layers of cookies with wax paper. Chocolate dipped cookies are only care package friendly during cold weather months. For a festive presentation, wrap each Celebration Sprinkle Cookie individually in a cellophane party bag and tie with a ribbon. Place 6 wrapped cookies into a gallon size zip lock bag, removing as much air as possible. Pad the shipping box carefully to be sure there is no movement in transit. Wendy, this post really resonated with me. I am so touched by it. 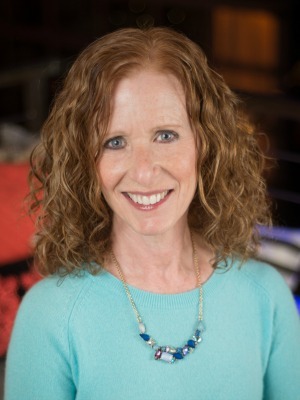 I remember your other birthday efforts and it may be that I’m partial to chocolate…but I am just really moved by the driving force behind these treats and that’s your love for your kids. 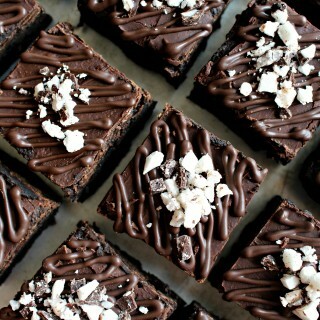 As a wanna-be baker myself, I know how much work it takes to make things like this. I applaud your efforts and I really feel the love you put into it. These cookies look insanely delicious, btw (love seeing the interior shot of it)! 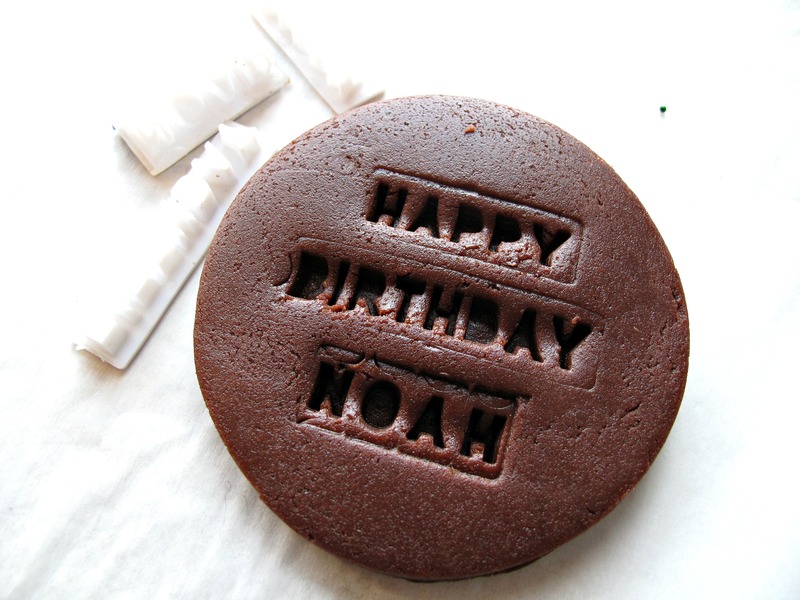 Now, most importantly, I want to wish your Noah a very happy birthday! May he have a beautiful year and a wonderful sweet life ahead of him. Thanks, Jess! Birthdays are a time to outdo, overdo, and do some more! 🙂 Chocolate and sprinkles are celebration food! Thank you Ronda for hosting. I appreciate all of the time you put in to social media promotion! 🙂 See you this weekend on #TheWeekendSocial. Oh my Wendy! These cookies are over the top fantastic. The time and love taken to make these tells me so much about you. What a loving mom you are. 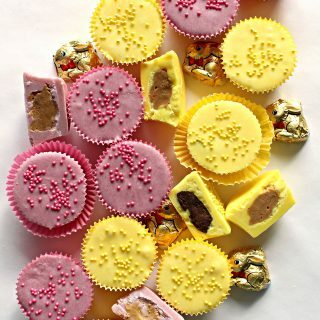 Sprinkles are the perfect festive touch! I am very excited to learn about these press in letters. My mind is reeling with the possibilities. Thanks for the inspiration. Oh Wendy these are wonderful! I bet your son really appreciates your extra effort. Love the embossing – that is extremely cool! Our kids just don’t know how much we love them – but they will some day. Birthdays are so much better with mom! 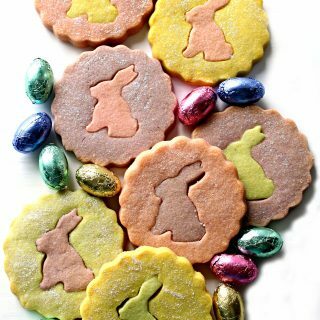 The cookies really look great – the chocolate on the bottom is brilliant! Thanks, Tricia! I admit that I do hold my breathe a bit to see what my son’s response will be when he opens the box and that I do smile when he asks, “How did you do that? !” I think he is getting the idea that I love him a bit. 😉 The embossing was fun and easy with the kit, and I loved the results! These are simply stunning! 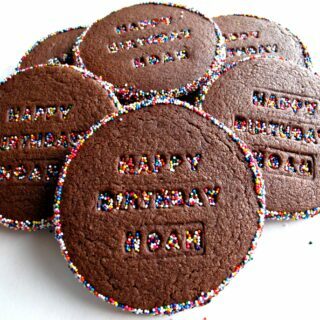 My own son, whose name is also Noah, has a birthday coming up in a few days, and although he’s a feeeeew years younger, I bet these as much as your son surely did! Thanks for linking up at Foodie Fridays and DIY last week! 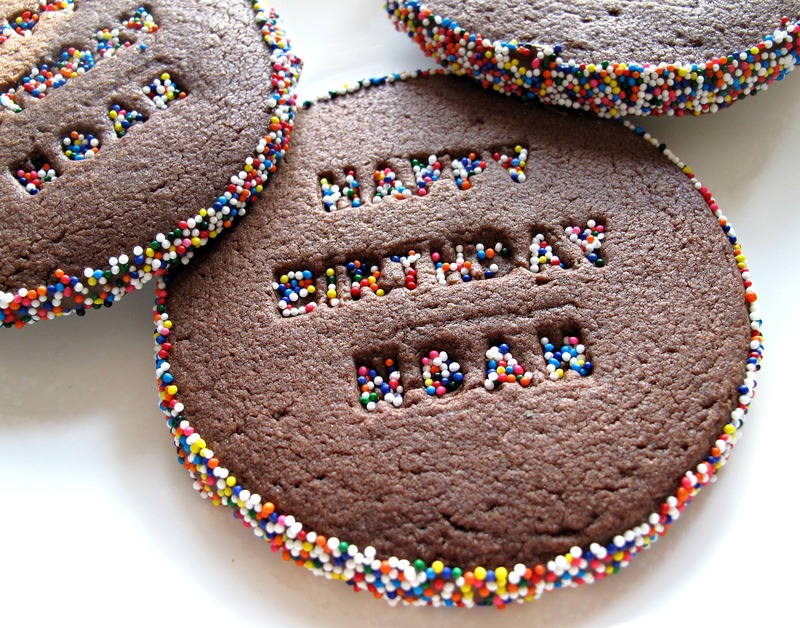 i LOVE the idea of cookie letter stamps! I’m stealing it (but is it stealing if i say i’m going to steal it?) 🙂 happy birthday to Noah! he’s a lucky dude to have a mom like you.